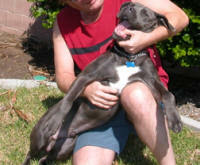 Home » Pet Adoptions » See, It can happen for you! See, It can happen for you! Beautiful, chocolate colored (considered a “Blue Pit Bull”), 7 month old male Pit Bull puppy for a good home and loving family. I was asked to house-sit a friend’s Pit Bull puppy while they found a place to live that allows pets, BUT NOW THEY WANT TO JUST GET RID OF HIM!!! This just breaks my heart… to just throw him away like this because THEY were irresponsible idiots. He is such a beautiful and loving dog. All he ever wants to do is play, love, and be loved. He’s rambunctious and has lots of energy, making him a great life-long family pet and best friend, though he’d fit best in either an adult home, or ideally in a home with a child (or children) 10 years and older with a yard for him to play in. He’s house-broken, has had all his shots, is in PERFECT health, and is neither animal, people, or food aggressive in any way, shape, or form — in fact, he’s a GREAT BIG GOOF-BALL and has been babied to this point in his life!!! I’d keep him myself, but I already have an older Pitbull of my own that requires my attention/care. Please help me to find him a good, safe, loving home… please don’t make this loving animal pay for the mistake of an irresponsible owner. I’m deathly afraid for him because his original owners mentioned just dropping him off at a pound somewhere, where we all know this wonderful doggie will eventually be put to death. I’ve spent only a month with him and have grown to love him myself — so will you. Just please, please, please help me to avoid letting his prior owners just dump him off somewhere to face certain death. He deserves better than this… he deserves a safe, loving, home where he can be someone’s life-long best friend. He deserves the home he SHOULD have had to begin with. Even if you can’t adopt this dog, PLEASE email this listing to as many people as you know in the Los Angeles area in order to help find him a good home. Please don’t let him die because his owners are ready to just throw him away!!! *Please Note: I am a Pitbull owner myself and know there are those who would seek to abuse these animals. As such, anyone responding to this listing should know I will not simply hand this dog over to just anyone. The dog’s safety is paramount to me, so if you’re not prepared to prove this beautiful dog will be going to a safe, loving home — don’t bother contacting me.